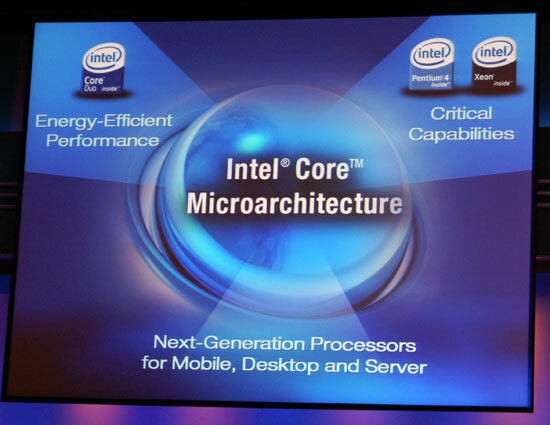 As expected, Justin Rattner announced the official name of Intel's next-generation micro-architecture: Core. All of the Core based products will be based on Intel's 65nm manufacturing process, which we've already seen with the 65nm Core Duo and Core Solo based microprocessors. 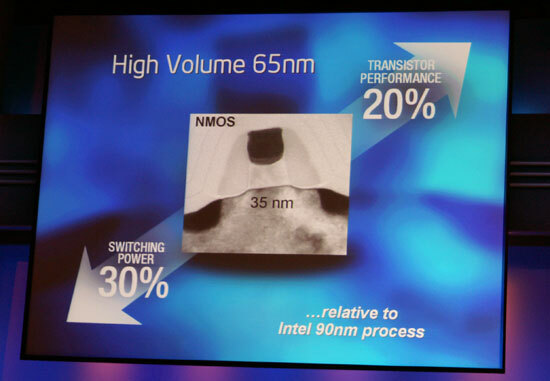 Intel claims that their 65nm manufacturing process offers 20% faster switching and 30% lower power. 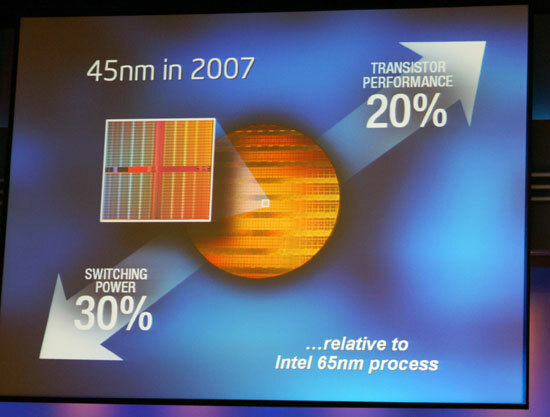 Rattner also mentioned that by the middle of 2007 Intel would begin their transition to a 45nm manufacturing process. Anand says that SSE will execute in a single cycle but I think Intel really meant that SSE will have single cycle throughput, not latency. Notice that in the slide Intel simply writes "single cycle SSE". SSE instructions (except some of the really easy ones) are currently broken down from 128bits -> 2x64bit instructions to actually execute. This has long been the biggest weak point of SSE. Do all SSE instructions execute in the same number of cycles? This crazy projections are always more exciting when they come from Intel because they do have a track record of NOT producing vaporware. On the other hand their performance figures are always way optimistic. "While we'll get a better idea of performance of Conroe, Merom and Woodcrest later today, Rattner did whet our appetites"
That's the proper use for the word.